The Crag™ Collar offers a fresh approach with a unique aluminum Talon Hook™ closure. It's strong while also being quick and easy to take on/off. Essential collar features: separate ID tag attachment point, strong/comfortable webbing, and aluminum V-ring. Not sure? 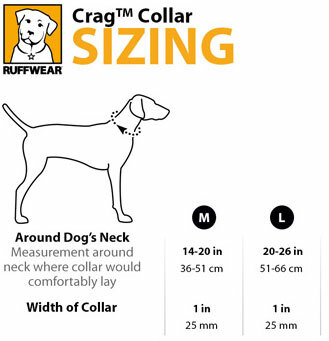 View the Ruff Wear Collar Comparison Chart to help find the one right for you. Click the button below to add the Crag Collar to your wish list.